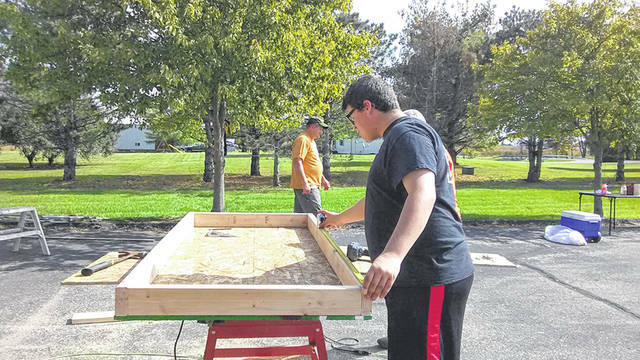 Jeffrey Nickels, 16, son of Rebecca and Tyler Stalder, of Minster, works on a project to restore a shed. Nickels served as project leader to earn the Eagle rank in Boy Scouts. MINSTER — Jeffrey Nickels, 16, of Minster, was awarded the Boy Scouts of America Eagle rank in a ceremony, Aug. 25, in Piqua. Nickels, the son of Rebecca and Tyler Stalder, has been a Boy Scout for five years and is a junior at Minster High School. He attends Tri-Star Career Center to study automotive technology. Nickels is a member of Troop 249, from the Church of Jesus Christ of Latter-day Saints, Sidney Ward. For his project he led a renovation of a storage shed on the Sidney Ward’s property used by the auxiliaries. The placement of the shed had previously been an Eagle Scout project about 20 years earlier by Sidney resident Jason Thorpe, who died in an accident. Volunteers helped Nickels save the shed from possible demolition, by replacing rotted wood and doors and installing vinyl siding. In addition to Boy Scouts, Nickels has volunteered at Ohio Living Dorothy Love for three years and for the YMCA’s Splash program for five years. He is employed by Wagner’s IGA in Minster.